One-of-a-kind accommodations in Downtown Paia. 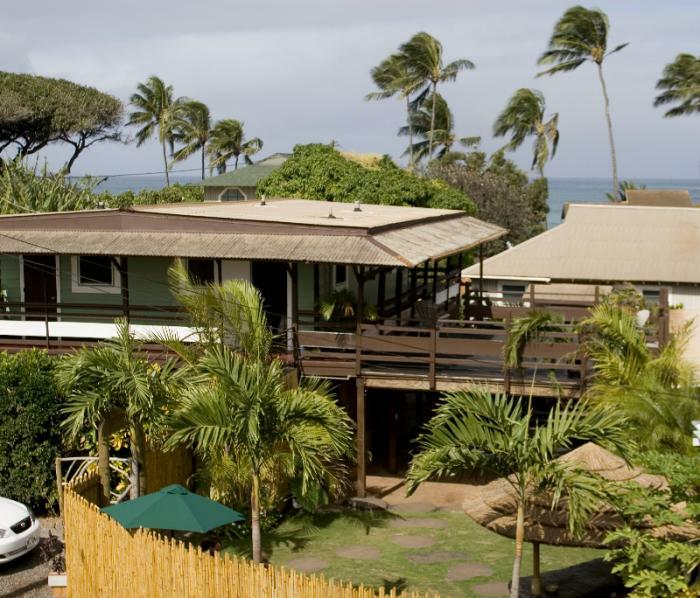 Since the sixties, Nalu Kai Lodge has housed vacationers to the North Shore. Now, under new ownership, discover a remodeled and reconditioned aloha Hawaiiana inspired setting. The ideal downtown Paia location has you just steps from shops, restaurants and beautiful sandy beaches. As you enter the Nalu Kai Lodge bamboo fenced courtyard you are greeted by palms and papaya trees swaying above the tiki bar and barbecue area surrounded by comfy lounge chairs and a serene lush tropical setting. The soothing sounds of the waterfall let you know you've arrived! There are eight individual bright and colorful rooms, each one tastefully decorated and complete with in-suite bathroom with custom tile work, mini-fridge, radio/cd player, closet and ceiling fan. There is also one large, one bedroom/one bath/full kitchen apartment. It's simple, super clean and cozy! Your charming room awaits you with fresh flowers and a sampling of macadamia nuts. Put your bags down and relax! Paia Bay Beach Park is around the corner. Paia's restaurants and shops are just beyond the courtyard and Ho'okipa Beach Park is a short five-minute drive. The North Shore of Maui is intoxicatingly laid back- you won't want to leave! Wireless Internet, lanai and 2nd story ocean view deck, not to mention washer and dryer for guest use.